Five studies to help you see how the gospel changes our lives, churches, and mission. Tim Chester shows how the gospel makes a real difference as he takes us to this little-read, life-changing New Testament letter. With clarity and insight, he helps small groups to be excited about, and equipped for, letting the truth transform their lives, their churches, and their mission. These five studies will help small groups and individuals see how to live the good life. 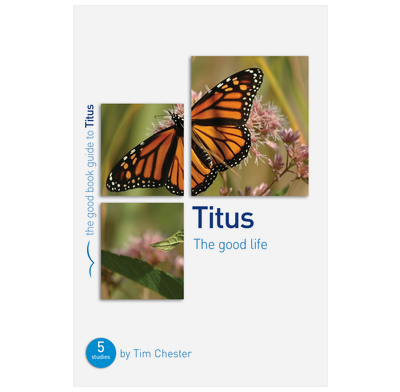 'Titus - the good life' is one of the series of new Bible study books which is very accessible. I have used this in a home group context and also in our Men's Study Group. The timeline is good for setting the context. The pattern of each chapter is familiar, with an open question to start with and exploration of the text with an emphasis on the writer's understanding of the theme of the particular passage. The layout is quite prescriptive, which may suit those less familiar with leading Bible studies. The extensive leader's notes at the back also assist this. It may be more helpful to have the leader's notes in a separate book or available on-line. There are some optional 'Explore more' sections, which are useful to have but may not be possible to include in the time available for most groups. Overall a useful addition to the range of Bible studies available, and we are always looking for good new material! This book about Paul's letter to Titus the author makes clear is about the gospel being central to everyday life and godliness and a model for ministry in our church. It is heart warming,helpful, encouraging, challenging and instructive. It is very helpful to use it alongside the Good Book Guide in a Bible Study group having been field tested with our home group with warm appreciation by all.I thoroughly recommend it. I highly recommend this book for small group discussions. It is thought-provoking, explains the text, and gives practical application. I have found these books helpful both as a participant and as a leader of bible studies.